At 7 a.m. Julie Pong, acting manager of Ceremonies and Events, begins convocation week daring to take on the day without coffee. “I don’t drink coffee; I’m running on a natural high!” she says. Pong is hoping to get five hours of sleep per night this week. 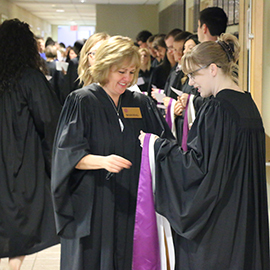 With 12 ceremonies, 321 volunteers, 9,100 guests, seven honorary degree recipients and 3,000 graduands over two campuses – there’s a lot riding on the planning and execution of Laurier’s largest event of the year: spring convocation. For the small team of four staff members – three in Waterloo, one in Brantford – convocation planning begins a year in advance and requires an impressive amount of collaboration across campuses. With many departments at Laurier involved in the planning and execution, Pong says each one has their own expertise and knows what they’re doing. On Laurier’s Waterloo campus, physical resources sets up the stage in the Athletic Complex and over 1,000 chairs for guests; food services caters each faculty reception; the registrar’s office calculates the students qualified to graduate; and printing services and CPAM produce the invitations, programs, posters and alumni handbooks. Everyone on campus works to minimize any hiccups to make a stress-free day for students and their parents – this is a time that should be purely celebratory. The hundreds of staff, faculty and student volunteers start their shifts at 8 a.m., some donning robes and hoods, to tackle the many different tasks at hand. Some volunteer roles are largely traditional, such as the academic procession. Faculty members dress in academic regalia. The bedel is armed with the university mace – a staff covered in provincial and university crests and topped with a crown mounted with jewels – and leads the platform party, a group that includes the chancellor, president, faculty and staff members and honorary degree recipients, into each convocation ceremony. Other roles are purely logistical. Volunteers are busy backstage organizing students in line, finding their robes and hoods, answering questions from guests, helping families find their seats and congratulating students on their graduation. Creating a great experience also means constantly pushing for improvements to enhance the day and keep up with the times. Shortening ceremonies, streaming the ceremonies live online and projecting social media tweets are recent changes that make it an extra special experience for guests and students. Pong was also excited to launch the online robe rental service for students this year, which helped graduates book their robes in advance of arrival. At Laurier Brantford, Beth Sanders, events and supports specialist, is thrilled to host more than 500 graduates and their guests in the historic Sanderson Centre. Teams of volunteers take on many of the same roles as those in Waterloo. Laurier’s convocation takes centre stage in downtown Brantford, with graduands walking in a procession, led by a bag piper, along Dalhousie St. from the Research and Academic Centre to the Sanderson Centre. “The Sanderson Centre facility here really impresses parents. It’s a spectacular space and we’re fortunate that it’s so close to campus. It’s beautiful to enjoy the day – the steps of the Carnegie Building are always full of graduates,” she says. Planning has already begun for next year’s spring convocation. The major change will be transitioning into hosting the ceremonies in the new Global Innovation Exchange Building on Laurier’s Waterloo campus. The building’s high-tech, 1,000-seat auditorium will be an exciting new venue for future celebrations, but will also bring new challenges and opportunities.